The ELCA delegation visited the Basilica of Hagia Sophia, a significant landmark in Istanbul. The church, built in the 6th century, was for centuries a Christian church. It was converted to a mosque after the Ottomans conquered the Byzantine capital of Constantinople in 1453 and renamed it Istanbul. 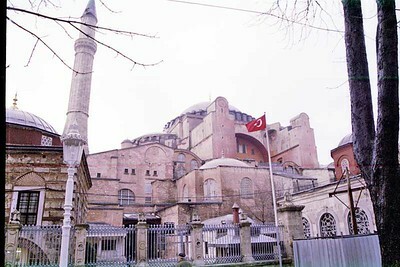 Today, Hagia Sophia is a museum and is being restored. 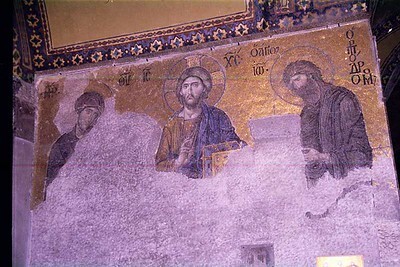 This is one of at least six mosaics being restored within the Hagia Sophia. About 99 percent of the population in Turkey is Muslim. 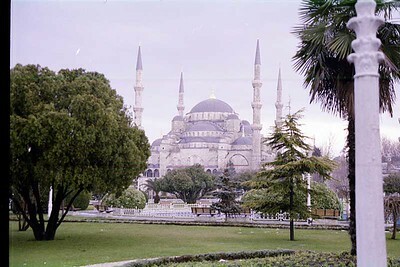 The 400-year-old Blue Mosque in Istanbul is the only mosque in the world with as many as six minarets. The ELCA-LWF delegation met with officials of the U.S. Consulate in Istanbul at the beginning of the visit. From left are the Rev. Karen S. Parker, assistant to the bishop, ELCA Pacifica Synod, Yorba Linda, Calif.; the Rev. 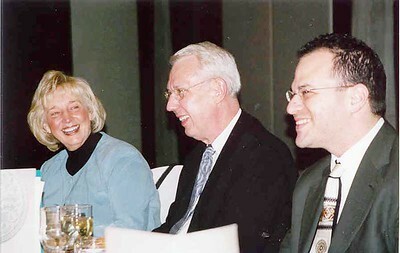 Lowell G. Almen, ELCA secretary; and Patrick Henish. The ELCA delegation traveled to nearby Halki Island to visit an Orthodox monastery which was closed by government order 33 years ago. A small staff remains there while the Orthodox Church works with the government to reopen the facility. 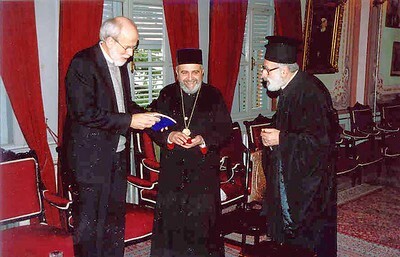 Bishop Hanson, left, presents gifts to Metropolitan Apostolos Daniilidis, center, monastery abbot; and Father Theodore, a monastery staff member. His All Holiness Ecumenical Patriarch Bartholomew greets the joint ELCA-LWF delegation at the start of the audience Jan. 28 in Istanbul. 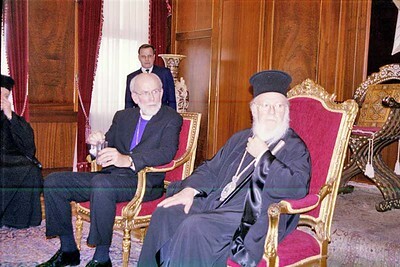 His All Holiness Ecumenical Patriarch Bartholomew, right, asked Bishop Hanson to sit next to him during the audience with the ELCA-LWF delegation. 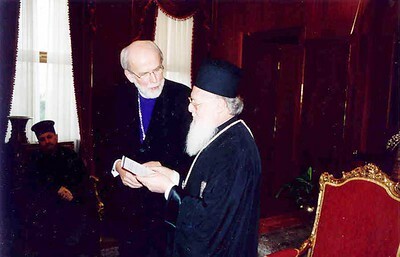 Bartholomew recognized Hanson as both ELCA presiding bishop and as president of the Lutheran World Federation. 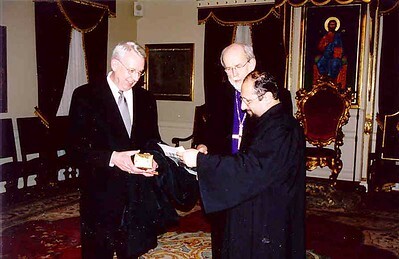 During a visit to the offices of the Armenia Patriarch in Istanbul, ELCA Secretary Lowell Almen and Bishop Hanson presented gifts to Father Sahak, second head of the religious council, and a representative of the Armenian patriarch. 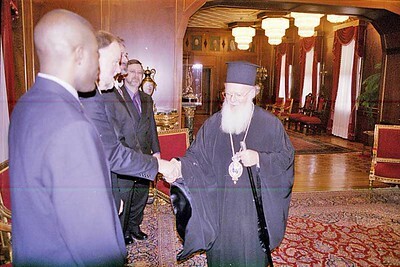 Bishop Hanson presented His All Holiness Ecumenical Patriarch Bartholomew with a copy of the ELCA's social statement on the environment, "Caring for Creation: Vision, Hope, and Justice." Bartholomew is known to many as the "Green Patriarch" because of his concern for care of the environment.